Every morning on his way to nursery school in Israel's northern city of Afula, Moshe Holtzberg, three, walks by an enlarged photo of his parents that the city's mayor has erected in their memory. "Bye-bye Ima and Abba" [Mummy and Daddy], he says, "I'm going to school," relates his grandmother, Yehudit Rosenberg. She and her husband, Shimon, have become the toddler's legal guardians since the death of his parents in the November 2008 attacks on the Indian city of Mumbai (Bombay). "He really lives with them and remembers them, almost as if they are alive," she says. "God forbid he should forget them." 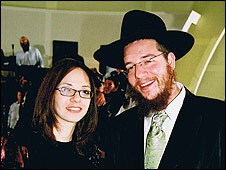 Rabbi Gavriel and Rivka Holtzberg were killed, along with four other Jews, on 26 November 2008, in an attack at the Jewish Chabad house in Mumbai. It was one of a series of shooting and bombing attacks throughout the city that left at 174 people dead, nine of them gunmen, and more than 300 wounded. Moshe's parents were emissaries of the Chabad Lubavitch movement, which sends married couples to thousands of destinations all over the world to cater for local Jewish communities and travellers by providing a spiritual centre, kosher food and sometimes a place to sleep. One of the most heart-wrenching images following the attacks was of Moshe crying, "Ima, Ima" [Mummy, Mummy] at his parents' funerals. "It's really a miracle he survived," says Mrs Rosenberg, Rivka's mother. "God watched over him." Last week, more than 2,000 relatives and friends attended an invitation-only memorial for the Holtzbergs held at Kfar Chabad near Tel Aviv. 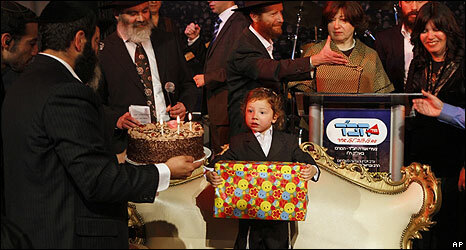 The black-tie event, sponsored by Chabad Youth, coincided with Moshe's third birthday. Holding his grandmother's hand, Moshe entered the tent resplendent in a little black suit and accompanied by his Indian nanny, Sandra Samuel, who rescued him during the attack. When the siege began, Ms Samuel hid in a cupboard until she heard Moshe shouting her name from a higher floor. She says she ran upstairs, found him standing over the unconscious bodies of his parents, and was able to grab him and escape outside the house to safety. Ms Samuel is staying with Moshe here in Israel to help him adjust. "I feel so sad for him that his parents aren't here. It's very difficult for me," she says, "but I have to be normal for the baby." The details of what exactly happened inside the Chabad house remain unclear, and no one is quite sure what Moshe saw, says Mrs Rosenberg. He doesn't speak about it, she adds, and they don't bring it up. For months afterwards, Moshe suffered from nightmares and had trouble sleeping. He would often dream about his parents and cry out in his sleep. On one occasion he woke up sobbing and said he had dreamt his mother was telling him that she loved him very much. Every so often he asks where his parents are. Mrs Rosenberg answers that they are in heaven. "I'm not sure how much he understands," she says. "He knows they suddenly disappeared and aren't here any more. But we don't discuss it. We don't want to raise a sad child. He should be a happy child." And today he is a happy child, she says. Like any kid of his age, he loves to draw and dance, to run and play in the sand. At his birthday celebration, he happily gobbled up his birthday cake and waved at the crowd of cameras snapping in his face. He watched a photo montage of his parents with curiosity, and even stood up on his chair and danced to songs sung in his honour. As is customary according to Jewish tradition, he also had his hair cut for the first time, and his long, curly locks were saved in a small silver pouch. But the happiness of his third birthday was clouded by mournful speeches, sombre traditional Jewish music, solemn expressions and the tears that flowed as friends and relatives watched his first haircut. Mrs Rosenberg noted it was "characteristic of the nation of Israel that sadness and happiness should come at the same time". "Even last year, when we were [in Mumbai] at the peak of sadness and agony and mourning, we still had to celebrate his birthday. We sang with tears in our eyes." She and her husband, in addition to dealing with the death of their daughter, have now found themselves raising a small child. "This takes us back at least 20 years." They say their deep religious beliefs have helped them through this trauma. "There are many things that happen that we don't understand," says Mrs Rosenberg. "Only God understands, and we believe everything God does is for the better. Even if it hurts us and even if we don't understand, it's all from heaven, and it's all for the better." The attack shocked the Chabad movement deeply. But Chabad Youth Chairman Rabbi Yosef Aharonov said at the ceremony that it had brought Jews together. "It was meant to hurt our beliefs and the strength of the Jewish people, but has accomplished exactly the opposite."